How Government Takes Away Your Right to do Something and Sells it Back to You as a "License"
Government has, for thousands of years, refined its methods of extracting wealth from people, perhaps with no greater efficiency than in 20th century America. The Federal Reserve, corporatism, and consumerism proved a winning combination for achieving what is known as The Great Fleecing. While this brought about the largest transfer of wealth in history from the middle class to the 1 percent, through taxes it has also fueled the growth of an incomprehensible leviathan. The Pentagon alone “spends” (actually borrows from the Fed) $600 billion a year using our tax dollars to perpetuate endless war, and it’s never been audited. 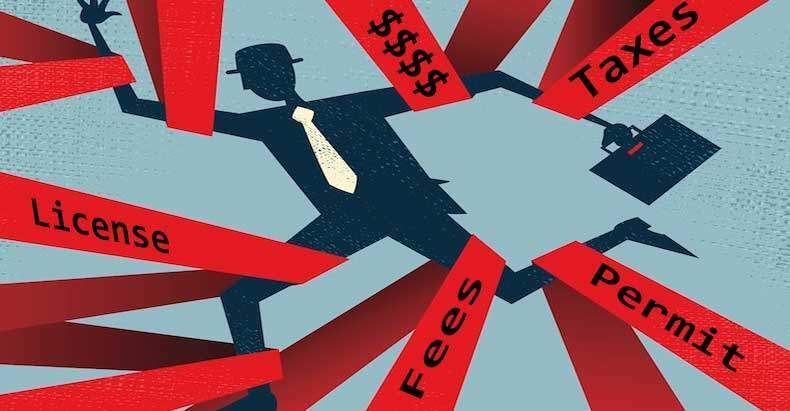 The federal tax code is a nightmare for most ordinary people, but this complexity is for the benefit of government’s corporate partners in extortion. The feds are always fiddling with taxes for the supposed benefit of American citizens—such as “housing stimulus packages” which ultimately benefited the bankers. The feds and the states join forces to tax every facet of life, for individuals and again for businesses. Sales taxes continually creep up, and new niches in taxation are always explored. When a small, aspiring business wants to hire someone, a double burden is created. Reports must be filed continuously for multiple government agencies, and profit that could stimulate the economy is diverted into feeding the State. A favorite of state and local governments is the practice of requiring everyone who wants to provide certain products or services to be “licensed.” These licenses involve paying government to take some sort of test and/or provide documentation of state-approved training, and then paying government every year—at steadily increasing rates—until you quit, retire or die. The notion of being licensed may sound nice to people looking for a service, and the basic idea of demonstrating knowledge about a trade is good. But mandatory government licensing can be described simply as extortion rackets with no real purpose in making things safer or better. Take landscaping, for instance. In most places, when someone wants to install ornamental plantings at a person’s private home, he or she must be “licensed” by government. Being licensed is not really a way to demonstrate knowledge of how to successfully landscape a home. It is a test and a lifetime of government fees. One of the most absurd examples of government licensing is African hairbraiding. In 17 states, people who offer this traditional practice must have a cosmetology license or another special license. The cosmetology license takes thousands of hours of classroom training and costs $5,000-15,000, and is usually unrelated to African hairbraiding. The Institute for Justice (IJ), along with several activists, has managed to dissolve these ridiculous barriers to prosperity in some places. 11 states now exempt braiders from the cosmetology licensing requirement. Others have fought the system and won. Sheila Champion, owner of The Good Earth Burial Ground, wanted to provide inexpensive, environmentally friendly burials with biodegradable caskets. The Alabama Board of Funeral Service would have effectively ended Sheila’s entrepreneurial effort by making her become a licensed funeral director. Even in a profession that can be dangerous to others, such as repairing gas leaks, the constant money shakedown from government has no bearing on the safety of such professions. Indeed, as IJ explains, it is not about protecting consumers, but protection from competition. Government licensing is a joint effort made possible by “the personal interests of those already practicing the occupations” and the state’s thirst for control—just another part of the corporatocracy. Another odious example lies in Louisiana, which is the only state that requires florists to be licensed. After years of legal wrangling and resistance from the florist industry, licensing requirements were reduced…but not eliminated. This collusion of corporate and state interests not only takes away the right of people to do things, but also acts as a throttle to prosperity. Perhaps not coincidentally, this serves the interest of driving people away from individual creativity to instead join the corporate drone workforce. IJ describes the situation in Minnesota. “The legislation recognizes that licensing laws are bad for Minnesota entrepreneurs and consumers. Entrepreneurs are hurt because such laws protect industry insiders from honest competition. Licensing reduces jobs by forcing entrepreneurs to meet expensive and unnecessary requirements before they can start working. In fact, converting licensing laws to certification laws could help create more than 15,000 new jobs in Minnesota. These are only snapshots of what goes on in all states. Government has taken up the role of Mafioso to shake down the citizens for its own gain and deter competition for its corporate partners. Since licensing is shown to have no benefit to consumers or service providers, and is successfully being challenged in court, what remains but an extortion racket? Government takes away your right to do something just to sell it back to you. Another issued a clarion call in the fight for freedom. Once these impediments to freedom and prosperity are broken down, will society plunge into a mad max world of people engaging recklessly in such services as braiding hair or landscaping a home? There are better ways to address the actual issue of consumers wanting to hire reputable service providers. In other words, working outside of government and the corporatocracy is more effective at making things better and safer than the sham of licensing.